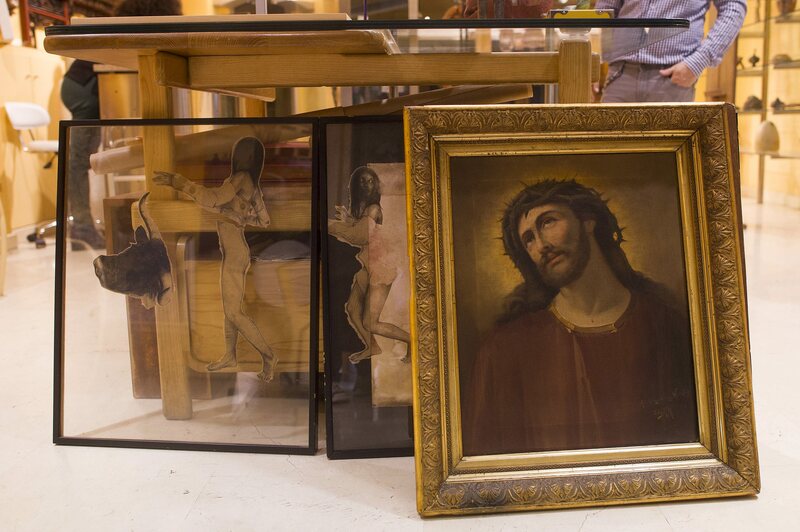 It feels like an eternity has passed since the halcyon days when octogenarian Cecilia Giménez took a poorly executed, flaking wall painting of Christ with the crown of thorns and transformed it into the global phenomenon that is Ecce Mono, aka Monkey Jesus. It was August 2012 when the painting by Elias García Martinez in the Sanctuary of Mercy in the town of Borja, outside Zaragoza in northeastern Spain, was found altered beyond all recognition. At first it was thought to be the work of vandals. The Martinez family lodged a complaint and conservators bemoaned the terrible fate of the 1895 work. There was even talk that the 81-year-old church volunteer and amateur painter might be criminally charged. 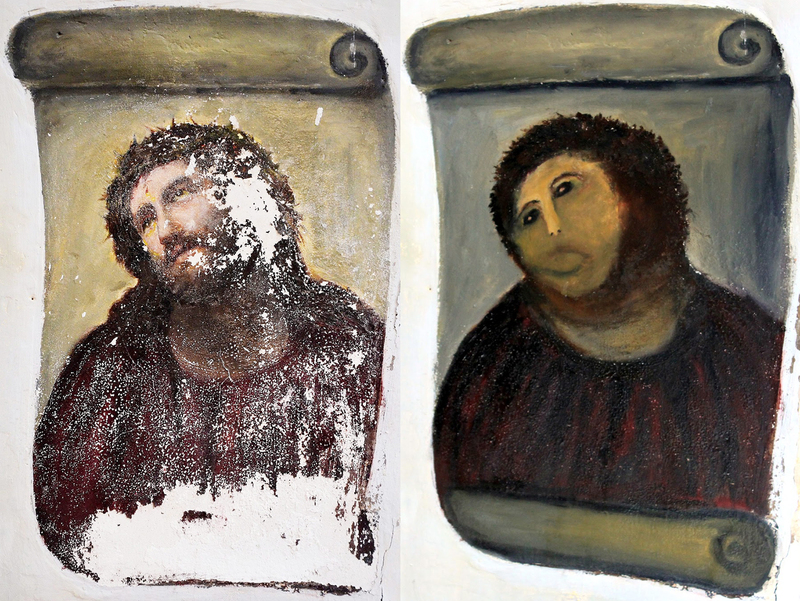 The possibility that there might be some attempt to restore the painting was bandied about, but there was so much paint loss before Ms. Giménez brought her simian vision to life that any restoration would have been more like a recreation. The root of the problem Elias García Martinez didn’t make a fresco. He just applied oil paints directly on the wall of the church instead of using water-soluble pigments on a layer of wet plaster. The oil paint doesn’t adhere and the moisture problems of the old church exacerbated the paint loss. 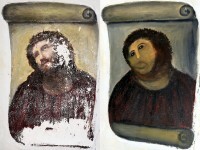 Then the news, and most importantly the picture, of the reconceived Ecce Homo hit the Internet. The story went viral; Monkey Jesus became a beloved meme; petitions were started demanding that Cecilia Giménez’s version remain untouched. The painting quickly became so popular, that sleepy, economically depressed Borja boomed into an overnight tourist attraction. Since then, hundreds of thousands of people have visited the Sanctuary of Mercy to pay their respects to the glorious botched restoration. It has graced t-shirts, mousepads and local wine labels. The story was made into an opera that debuted in the town this August, four years after Giménez picked up her paintbrush and had a date with destiny. Instead of getting arrested, Giménez got a cut of the merchandising revenue. The town’s good fortune doubtless blunted the sting of the loss of the wall painting for the locals. Perhaps the Martinez family may find some solace now because an oil-on-canvas Ecce Homo painted by Elias García Martinez the year before he made the mural has been discovered. 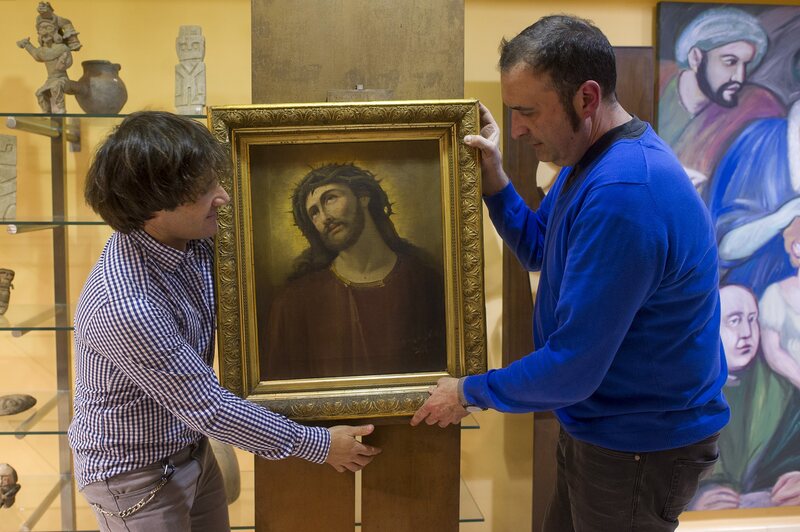 Zaragozan antique dealers Ostalé and David Ricardo Maturén found it in an Aragonese private collection. It’s the same size as the church painting — 55 by 45 centimeters — and is believed to be the same in all other aspects as well. Since Martinez is known to have spent a mere two hours painting the one in Borja, perhaps he copied from his own canvas. Or maybe he didn’t even need it with him. The subject was a common one, a clothed version of Baroque master Guido Reni’s 1630 copper panel painting Head of Christ Crowned with Thorns. By the late 19th century it was so widely used an image, mass-produced on every medium from souvenir plates to postcards, that most any artist would have known how to crank it out given a couple of spare hours. For now the canvas is being kept in an art gallery out of public view. The plan is to have a grand opening where the painting can be viewed alongside its more evolved primate cousin. Naturally the guest of honor will be Cecilia Giménez. The art dealers insist the painting is not for sale but has already attracted interest from art collectors around the world. This entry was posted on Monday, December 19th, 2016 at 11:42 PM	and is filed under Modern(ish). You can follow any responses to this entry through the RSS 2.0 feed. You can skip to the end and leave a response. Pinging is currently not allowed. With a caption like this, how could I not read this post? Thanks for sharing. A cackle-worthy tale for the Christmas season. Another day in the life of this image — one wonders, is any version of the painting an “original”? (My thoughts on this from when “Ecco mono” first launched). If YOU’RE going to be critical, Alf, at least get YOUR own middle school grammar right! Title of the year, Livius. Now to find the long lost Chimpanzee Jesus.